Aix in Provence tapestry shows a beautiful garden estate, the work of artist Vail Oxley. In this work, we see a European mansion and an abundance of blooms and foliage in its gardens, and a path leading to the sun lit villa. The sky is bright blue and there are peach pink clouds visible. The path itself is illuminated with dappled light through the trees. This work is beautiful in color and composition, with a palette ranging from bright sunlight to the deep shades of emerald green in the tree foliage. 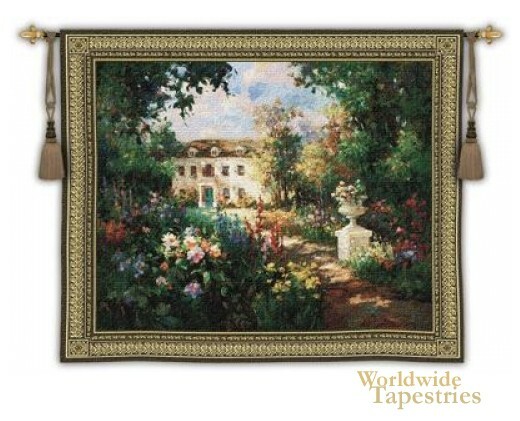 This Aix in Provence tapestry is backed with lining and tunnel for easy hanging. Note: tapestry rod and tassels, where pictured, are not included in the price.